Using effective and efficient policies, CVMA supports the transition to a low carbon economy. Vehicle manufacturers are reducing greenhouse (GHG) emissions from virtually every aspect of their manufacturing operations and by taking a multi-technology pathway across all new vehicle product offering, including electric vehicles.Both vehicle manufacturers and government regulators in Canada and the U.S. have already and continue to commit large resources to addressing vehicle GHG emissions from light and heavy duty vehicles which represent the opportunity for the greatest positive impact for the auto industry. Advancements and introduction of vehicle technologies will deliver these reductions in an efficient and cost effective manner over time. Policies to support the competitiveness of vehicle manufacturing plants so as to reap the full employment and economic benefits associated is most critical for the development/production of advanced technology vehicles in Canada contributing to a more sustainable approach to low carbon economy. A partnership approach between the government and industry is the most effective way to reduce GHGs, preserve consumer choice and demand, and achieve the government’s goals without compromising the strength of the Canadian economy or constraining consumer choice. Vehicle manufacturers are leaders in reducing emissions from their manufacturing operations, through the efficient use of natural gas and purchased electricity as a source of energy for plant operations, in waste diversion and in the products they sell. 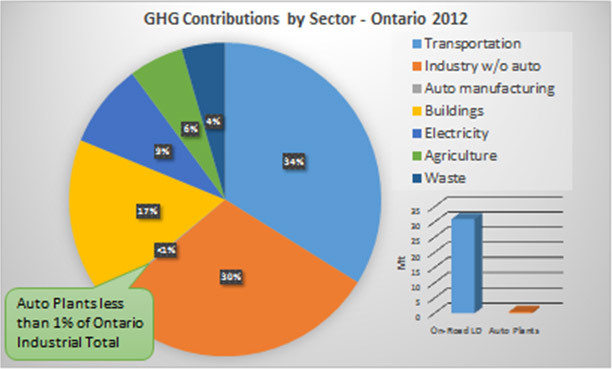 Vehicle manufacturers have mature energy conservation programs which have resulted in automotive manufacturing contributing less than one percent of Ontario industrial GHG emissions (2012 data). Proactive reductions in emissions from our operations was achieved by implementing energy efficiency projects, lighting retrofits, ventilation optimization, process optimization, and aggressively shutting down equipment and processes when not needed. As a sector, auto assembly is one of the lowest in Ontario in terms of energy intensity and absolute emissions . CVMA members have already or will be eliminating all waste to landfill, likely having the highest diversions rate (97% on average in 2013) of any sector in the province of Ontario, contributing significantly to the reduction in emissions associated with new material use and waste disposal. More than 99% of GHG emissions created at an assembly plant is from the combustion of natural gas. The largest use of natural gas is to condition the air in the paint booths, to dry the paint in an oven, and to abate volatile organic compounds in a Regenerative Thermal Oxidizer. Significant amounts of natural gas are also used for comfort heat for employees. The level of natural gas consumption is also related to our Canadian weather, creating a cost which is not incurred by competing facilities operating in warmer climates such as the Southern U.S. or Mexico for example. Despite collaboration with utility providers and other industry experts, it is increasingly challenging to identify new technically and financially feasible reduction opportunities barring any technological breakthrough. Environmental sustainability is part of the industry’s mindset and is an integral part of the industry’s business culture. Vehicle-related Greenhouse gas (GHG) Emission Contribution in Canada. Transportation emissions from the on-road light duty vehicle sector accounts for 11% of GHGs nationally (84 Mt). GHG emission regulations have been published for the Light Duty Vehicle Model Years (MY) 2017-2025. Canada has adopted these regulations on a harmonized basis with the U.S EPA and with the support of California, effectively creating one continental standard. All Canadian jurisdictions (federal government, provinces and territories), must continue to support the national implementation of advanced emission and GHG reducing technologies as the most cost effective approach to emission reductions for governments and consumers. Overlaying sub-national policies on these national regulations, which are aligned across North America, will sub-optimize the industry’s ability to effectively deploy these technologies and will do so at an increased cost to consumers. The unprecedented stringency of the new 2017-2025 MY GHG standards will require manufacturers to spend an estimated $200 billion USD in advance vehicle technology development focused on vehicle GHG reductions; an additional estimated $100 Million spending on electric vehicle development. These regulations require manufacturers to adopt a multi-technology pathway for compliance in which electric vehicles will become increasingly more prominent during this period of rapid technology deployment of new GHG reducing technologies. An unprecedented 3 to 5% year over year improvement requirement; previously only an averaged from 1.1% to 1.3% per year. 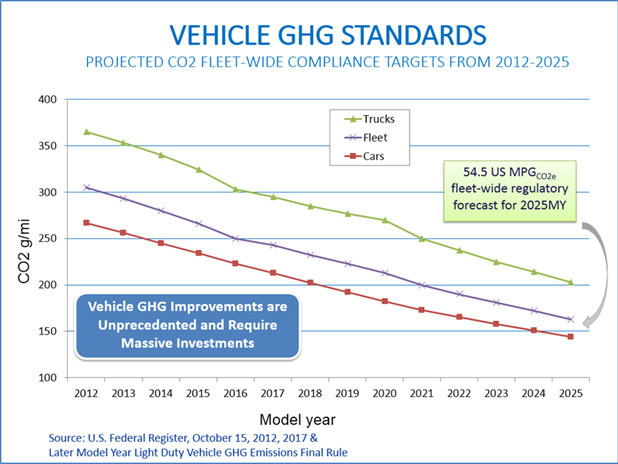 2025 model year (MY) light duty vehicles are projected to reduce fuel consumption and GHG emissions compared to 2010 MY vehicles by approximately one half. From 2011 MY, this will result in an estimated cumulative reduction of 266 megatonnes (MT) of carbon dioxide equivalent (CO2e) emissions on a national basis from the LDV fleet (see Figure 1.) below. Public policies that educate consumers, increase consumer demand and support consumer use of these new vehicle technologies will be critical to increasing the consumer adoption of these alternative energy vehicle choices. Government policies should not discriminate against the broad range of technologies being offered to consumers. CVMA also supports for further development of Low Carbon Content Fuels (LCF). Expanding appropriate renewable fuel delivery infrastructure would provide needed support to such vehicle technologies, further enhancing the potential GHG emission reductions or environmental benefits. Additional GHG emission reductions (up to 23% – Reference: Environment Canada Heavy Duty Vehicle and Engine GHG Regulations, February 2013) will be achieve as a result of the regulation of heavy duty vehicles and engines (HDV) through to 2018 and the introduction of even more stringent regulation for Model Year 2019 and beyond furthering providing tangible and significant emission benefit from heavy vehicles across Canada. In Canada, Québec, British Columbia and Ontario lead in the adoption of plug-in electric vehicles, plug-in electric hybrid vehicles (PHEVs) and battery electric vehicles (BEVs), as a result of a comprehensive set of policies aimed at increasing demand via consumer incentives and supporting consumer adoption though programs that expand the home, work, and public charging infrastructure. The new federal vehicle GHG regulations promote bringing these vehicles to market, however, it is essential that the necessary market supports are in place to encourage and support the increasing consumer adoption of these technologies. Fast charge stations (both level 2 and level 3) networks in and between major cities are needed to make it practical for consumers to consider all plug-in vehicles and maximize electric energy travel. While plug-in electric vehicles have the potential to significantly reduce vehicle GHG emissions, there continues to be technological challenges that need to be overcome. The utility and functionality of a battery electric vehicle is currently limited in cold climates and winter driving conditions. In some areas of the country the climate is suitable for most plug-in vehicles. The same cannot be said for the prairies and the north where the distances between major centres as well as the climate provide significant limitations to the use of plug-in vehicles, in particular battery electric vehicles. A policy leading to Zero Emission Vehicle (ZEV) regulation should be avoided. Such an approach, which requires manufacturers to sell a specific ratio of the new vehicles sold be zero emissions (electric vehicles) at rates that exceed the natural consumer uptake of these vehicle technologies, will unnecessarily force additional costs on consumers and restrict their choice of non-electric vehicles given the availability of readily accessible recharging infrastructure and their need to transport people, goods or services. Due to the size and age of the on-road fleet across the country, it will take significant time and effort to replace the older higher emitting vehicles in the fleet. However, there are options to encourage the expansion of battery electric, plug-in hybrid electric, and hydrogen electric fuel cell vehicles which do not involve the noted risks inherent in the ZEV legislation enacted by some U.S. states and Quebec. These options will require a coordinated holistic approach with extensive education and consultation to continue the advancements already made in this area, including accelerated turnover of the existing on-road fleet as one of the most cost effective way to reduce vehicle related GHG emissions. Vehicles are the top Canadian export at $61 Billion in 2016.